The Pointer Sisters began their formal vocal training in their father’s church, The Church of God in West Oakland, California. They went on to achieve worldwide fame and have secured a place in pop music history as a dynamic female group! 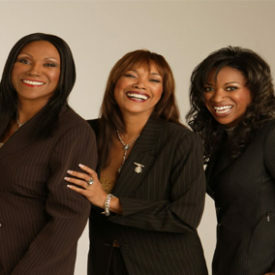 Their first performance in Los Angeles at the Troubadour club was hailed by critics for its versatility and range and called The Pointer Sisters “the most exciting thing to hit show business in years.” Their 1973 debut album gave us the singles, “Yes We Can, Can,” which reached #11 on Billboard magazine’s pop singles chart. The album was certified gold and the group had become the most talked-about new act of the year. The following year, the sisters released That’s A Plenty, an album that included a bona-fide country-western tune, “Fairytale,” written by the sisters. The single hit big on both the country and pop charts. As a result, the sisters became the first black female group to ever perform at the Grand Ole Opry in Nashville, Tennessee. They also became the first contemporary act to perform at the San Francisco Opera House and released a live recording of the performance. In 1975, “Fairytale” won the sisters their first Grammy Award, for Best Country Performance by a Duo or Group with Elvis Presley later covering the tune. That year, the Pointers released their fourth album for Blue Thumb. Entitled Steppin’, the record included “How Long (Betcha Got A Chick On The Side)”; co-written by the sisters, it went top 20 on the pop charts and sailed all the way to #1 on R&B. In 1976, the sisters hit the big screen, joining Richard Pryor in the film, Car Wash. “You Gotta Believe” which was featured on the film’s soundtrack, rose up the R&B charts. In 1977, the Pointer Sisters released Having a Party, their last album for Blue Thumb and their last album as a quartet. In an effort to change their style, the sisters signed with Planet Records and teamed up with Richard Perry, a well-known producer who had previously worked with such artists as Barbara Streisand and Carly Simon. Together, they decided to record a rock ‘n roll album. The group’s debut single, Bruce Springsteen’s “Fire,” went all the way to #2 on the pop charts and went gold. Boosted by “Fire,” the Energy album was certified gold and went on to spawn another top single with “Happiness”. In 1980, the group released the gold-certified Special Things; it featured the song “He’s So Shy” that went to #3 and gold status. In 1981, the group released Black & White, which included one of the biggest hits of the year, “Slow Hand.” The single topped out at #2 on the Billboard charts, and became an anthem for women across the country. Alas, the title of their 1983 album summed up exactly what the trio was about to do: Break Out. Upon its release, Stereo Review called the new album “the Pointer Sisters at their sassiest, brassiest, up-tempo best.” When Ruth took the lead for “Automatic,” her deeper-than-deep vocals practically leapt off the vinyl, and helped the single go all the way to #5. The Pointer Sisters landed all over MTV, becoming one of the first black acts to be played in heavy rotation. “Jump(for my love)” raced to #3 on the pop charts. “I’m So Excited” hit the Top 10 and became a Pointer classic! To date, the song has been played over 2.5 million times on radio. “Neutron Dance,” featuring Ruth’s gospel-spiked shouts, rose to #6 on the pop charts as its video dominated MTV. Paramount Pictures included the hit in their film, Beverly Hills Cop, starring Eddie Murphy. Finally, Break Out spawned a sixth single, “Baby Come And Get It.” The success of the album earned the sisters two Grammy Awards (Best Vocal by a Duo or Group for “Jump” and Best Vocal Arrangement for “Automatic”) and two American Music Awards. Break Out was certified triple-platinum, making it the biggest selling album of the Pointer Sisters’ career. While they toured heavily and made countless television appearances, the group made a move to RCA Records, which released the Contact album in 1985. The set’s first single, “Dare Me,” hit #11 and was accompanied by another stylish video that established the Pointer Sisters as trendsetters for a whole new generation. Within three weeks of its release, Contact was certified platinum, and the group went on to win another American Music Award for Best Video Group. 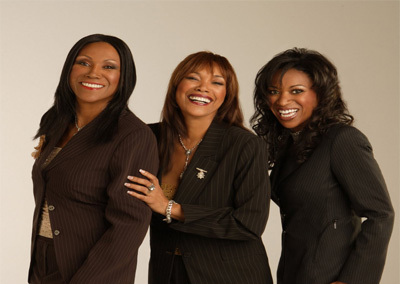 In late 1986, the Pointer Sisters released their second album on RCA, Hot Together, which spawned a top 40 hit with “Goldmine.” The Pointers helped promote the album in 1987 by hitting prime time with their first television network special, Up All Night, featuring the sisters touring Los Angeles night spots with guest stars Whoopi Goldberg, Bruce Willis and The McGuire Sisters. In 1994, a massive crowd swarmed to Hollywood Boulevard to see the ladies receive a star on the Hollywood Walk of Fame, an event proclaimed “Pointer Sisters Day” in Hollywood. That same day, it was announced that the group would begin a world-wide tour of the Fats Waller musical, Ain’t Misbehavin’. They toured with the show for 46 weeks and recorded a cast album. The sisters went on to be honored on the Soul of American Music Awards and were also inducted into the Soul Train Hall of Fame. They performed a special concert at the White House for then President Clinton. In 1996, they were one of the legendary acts that performed at the closing ceremony of the Olympics in Atlanta, and the group was saluted with Fire–The Very Best of the Pointer Sisters, a 36-song anthology that chronicled the sisters’ career. In recent years, the group has performed with some of the greatest symphony orchestras in the world, including San Francisco, Jacksonville, Atlanta’s symphony orchestra and the renowned Boston Pops. In 2003, Ruth’s daughter; Issa Pointer enthusiastically joined the group. Issa has been singing since childhood and is a natural performer. Over the years, she has occasionally joined her mother and aunts on the road and on stage–just for fun! During the Pointer Sisters’ 1985 tour, Issa, then just 7 years old, was fitted with a bright red wig to match her mom’s wild hairstyle! Well, she’s all grown up now and has the vocal chords to prove it. Ruth, Anita and Issa were a smash hit at Night of the Proms, which spanned over 50 sold-out performances throughout Germany, Holland and Belgium, and has secured the group many more successful tours in Europe. In 2004, the group recorded a live CD/DVD, which captured the energetic Pointers performing the hits that fans of all ages continue to enjoy! Ruth, Anita and Sadako maintain a busy touring schedule and perform the music of The Pointer Sisters all over the world.